I was born in Miamisburg, Ohio and spent all of my early life there. My mother tells me that when I was around 2 or 3 years old I would take pots and pans out of the stove drawer place them on the floor like a makeshift drum kit and play them with spoons. She told me I would play them in order by tones and knew that drums were probably in my future. So after several toy drum kits (and several years of therapy for her) they bought me my first snare drum and I enrolled in 5th grade band at Carlisle Intermediate School. I knew immediately that this was a definite interest for me. Fortunately a few years later Carlisle started a Jr. High Jazz ensemble. I was able to start playing organized music on a drum kit. I was also lucky enough to have a guy by the name of Calvin Kesterson who was a couple of grades older than me to watch. I would listen to him and steal every groove or lick that he played and practiced them. God had blessed me with some natural ability so I progressed very quickly. I played my first drum solo in a concert when I was in 8th grade and it was pretty horrible but I must have done a few things impressive because I received a standing ovation and that’s all it took to light my fire. I performed with the Miami University Jazz Ensemble my freshman and sophomore years and was able to perform with some really great players. 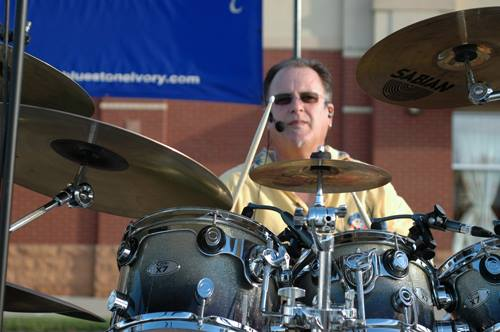 During the summer of 1982 I auditioned for Taft Attractions and became the drummer for a couple of live shows at Kings Island amusement park. This experience taught me a lot about endurance and showmanship because I played around 200 or so shows that summer. After my sophomore year ended I decided that I really did not want to be an educator and couldn’t help remembering how cool it was to record albums so I enrolled at The Recording Workshop in Chillicothe Ohio to study for a degree in sound engineering and performing. 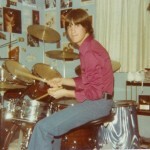 I graduated in 1983 and worked as an engineer/drummer for hire in studios all over Dayton and Cincinnati. This was an awesome experience for me. I married in 1984 and with that being said I knew that I had to get a full time job to support my upcoming family so I only did recording on the side. I was in several weekend warrior bands throughout the next several years playing everything from pop to metal and even some country. 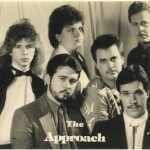 The only band of note that I really gigged with regularly was called The Approach. We played mostly in the Cincy and Dayton area, and it was a blast. But eventually it ran its course and my children were getting older so I took a break from playing and did the soccer dad thing. In 1993 I was hired at Ford Motor Company and was placed on afternoon shift for about 7 years and so gigging was virtually impossible. I met Ted Donohue while working there and knew that he was an incredible singer and musician and we talked about music all of the time. I told him that I was eventually going to get back on the throne when the time was right. 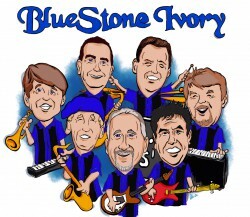 I went to a few Bluestone Ivory gigs and thought how awesome it would be to land a job like that. After I was able to get back to working daytime hours, my kids were in high school and running me all over the place for tournaments and such, so my little break from playing music turned out to be about 20 years. After they graduated and started college I was really getting the burn to play again so I started working my chops again and went on several auditions that most of which I turned down because it just wasn’t what I was looking for. In 2010 I answered a Craigslist add about a classic rock band that was forming and landed the gig. The band was called Modern Rewind and we played mostly on the east side of Cincinnati. Due to some of the guys work schedules we didn’t book shows very frequently so I continued looking. That is when fate knocked on my door. Ted came to one of our gigs and came up to me after the first set and said that he really enjoyed my playing and didn’t know that I sang also. He asked me if I would be interested in subbing with Bluestone and of course I said absolutely!! I played a couple of dates with the band and was asked to become full time. I consider it an honor to be a part of such a group of wonderful people and not to mention fabulous musicians. I am looking forward to making some great music with them. It truly is a fantastic opportunity for me.